Not really. But if that’s all the time you have to explore the Douro Valley, a one day tour will give you a taste of its beauty, culture and gastronomy that will linger in your memory and make you yearn to return. The easiest way to do this is on a day trip from Porto but see below for options if you have more time. Douro Valley wine tours vary so consider what you’re most interested in experiencing before booking. Most Douro day trips will include a visit to at least one winery, with tastings, and a boat trip on the river. Some may take you to one of the towns or villages in the Douro and they may or may not include lunch. I gladly accepted an invitation to join a luxury small group tour which involved two traditional wineries, a river trip and a wonderful restaurant. Even though I’ve been to the Alto Douro wine region several times, I learned local secrets and more about the influence of port wine on the landscape and culture, had special tasting experiences and discovered some terrific places to visit. Instead of launching into a set script about the Douro Valley and its wines, Ana, our guide for the day, found out how much we already knew, which port wines we had tasted and what we would be most interested in trying. Since we all had some knowledge of port wine, she skipped some of the basics and tailored her stories to suit our group. During the 2-hour drive from Porto to Pinhão, I learned how the age-old animosity between Britain and France led to the creation of port wine and how the valley’s vineyards spread up the hillsides on man-made terraces as demand grew, transforming the topography. Douro Valley families had been producing wine for their own consumption for centuries and had no need to preserve it. However, Douro wine destined for the Brits had to be fortified so that it would still be palatable after the journey overseas. Hence the creation of port wine, so-called because it came from the port of Porto. At some point, the practice of adding aguardente (brandy) to wine caught on and people in the Douro began keeping their own barrel of vinho generoso (fortified wine). They top up the barrel with fresh wine each year so, unlike official port wine which is heavily regulated to meet strict quality control standards, each household’s vinho generoso is always unique. While other passengers on the 1-hour boat trip we took up and down the Douro River were sipping an LBV (Late Bottled Vintage) port, which is usually very nice, by the way, Ana poured us her own family’s vinho generoso to try. Tawny in colour and cloudy from centuries-old sediment, it tastes sublime. The sediment itself is worth a fortune and is highly sought after by those who want to start their own vat of vinho generoso. We rounded off the one day Douro tour with another version of this unique wine at Quinta de Tourais. Watching owner and wine-maker, Fernando Coelho, siphon it from his barrel and present it to us was almost as much fun as drinking it. Not as old as the Ana’s, Fernando’s vinho generoso wasn’t cloudy, although still amber in colour, but very easy to drink. 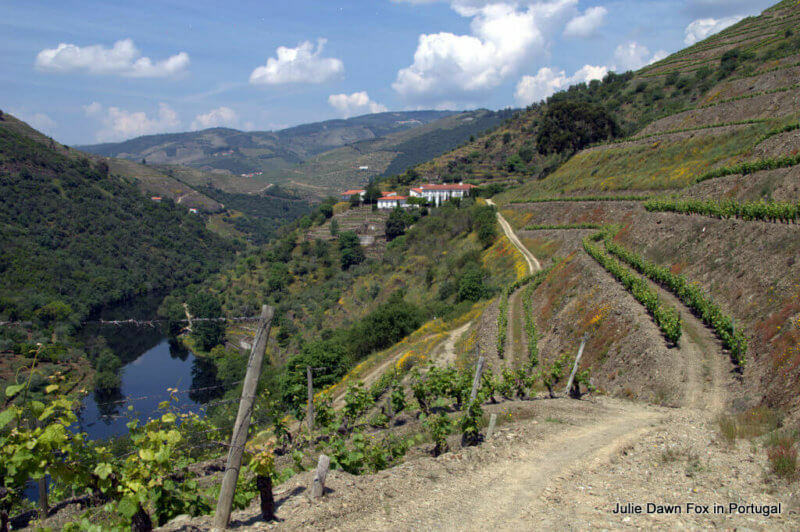 Ana selects wineries for her Douro Valley tours with care. Quinta de Tourais is small, quirky and, like Fernando, full of character. His T-shirt sported an intriguing image of a bull with a fist for a face. “It’s to give a face to a bull that never existed,” he explained. It’s a pun on the name of the estate; Tourais sounds rather like touro, the Portuguese word for bull. Being a small producer, Fernando is able to use traditional methods and equipment for wine-making, supplemented by modern techniques for temperature control that enable him to produce quality, reliable wines. When we visited, the granite grape crushing tanks were full of stacked bottles of his 2014 vintage, which also bears the image of the bull. “I’ll have to sell all of these before the next harvest,” he told us, laughing but serious. The mysterious bull is not the only piece of artwork. Each time Fernando produces a new variety of wine, one of his friends designs a new bottle. He’s developing quite a collection. One that’s a hit with our group, both for its design and the actual wine, is the 2013 Miura, a smooth blend of Tinta Barroca, Alicane Bouschet and Touriga Nacional. Almost as popular as the wine were the fat almonds, grown on the estate and sauteed in turmeric, that accompanied the tasting session. I can still taste them. Note: Quinta de Tourais have two rooms available for paying guests and a small terrace pool. Click to check availability. We were treated to other divine local products with our wine tasting at Quinta do Panascal, an estate which produces grapes and wines for Fonseca port wine and houses their tasting room and shop. The soft, sour goats cheese we enjoyed so much is only sold locally in a butcher’s shop in Pinhão. The Siroco extra dry white port served with the cheese was surprisingly creamy and I’m not the only one who bought a bottle to bring home. The highlight of our tasting session was opening a 1987 vintage port wine using flame. I’d seen this process from a distance somewhere in Lisbon but never been close enough to understand what was going on, let alone taste the contents of the bottle. Tom was awarded the privilege of heating the tongs in the flame then applying them to the neck of the bottle while the woman from the wine shop poured cold water over it to cause the glass to shatter. She swiftly and carefully decanted and strained the precious liquid and Ana showed us how quickly the vintage port changes colour once it’s exposed to the air. It went from a tawny to almost a ruby colour within minutes, which is why you need to drink a vintage port wine within 2 days of opening as it quickly deteriorates. As for the taste, it certainly lived up to the hype and ceremony. As well as being one of the few places you can taste Fonseca’s port wines (they don’t have a shop or cellar in Vila Nova de Gaia like most of the other port wine lodges), Quinta do Panascal is special for its scenic setting and insistence on using traditional methods of wine production. All their grapes are stomped by foot in granite tanks, which involves almost continuous hard work over the several days of fermentation. The quinta’s main buildings overlook the contoured hills that slip into the River Tâvora and the view from the terrace is adorable. Better still, you can follow a short self-guided walking route, with or without an audio guide, through the grape vines. As if all these experiences weren’t enough to create lasting memories, the place where we had lunch was sublime. Top Portuguese chef, Rui Palha picked the perfect spot for his elegant riverside restaurant. As we walked along the boardwalk towards the white tables on the terrace, every one of us was oohing and aahing over the views and setting. Our tasting menu included such oddities as a soup pie. That’s my rather crude description of an ingenious pastry parcel wrapped around caldo verde, Portugal’s beloved kale soup. Topped, as the soup usually is, with a slice of chouriço and a sliver of green, it combined all the flavours of a traditional dish in an innovative package. The other unexpected taste sensation was the fruit and Space Dust (aka Pop Rocks) palate cleanser that had us all giggling in childlike wonder as the crystals began exploding in our mouths. Do you need a tour to visit the Douro Valley? You can visit these Douro wineries and others on your own, although you’ll need to book ahead for small independent wineries and arrange your itinerary accordingly. The beauty of visiting the Douro Valley with a tour, whether it’s private or small group, is that you can simply relax and enjoy the experience, knowing you’re in capable hands. You’ll learn more than you would if you explore alone and, especially if you go for the more exclusive Douro tours, get to experience things you wouldn’t otherwise do, like vinho generoso. For me, it’s a treat not to have to worry about driving along narrow winding roads, getting lost or dealing with the logistics of opening times etc. There’s also no need to restrict your wine intake if you’re the designated driver. After all, tasting Douro wine and port wines is one of the highlights a visit. Looking for a private Douro tour? If your budget is more modest, there are several full day small group Douro Valley tours from Porto that include the opportunity to take a 1-hour boat trip from Pinhão as well as great views, winery tours with standard tastings and lunch at a traditional local restaurant (not DOC!) for around €100. Check this one out. If you’re on a tighter budget and would prefer a do-it-yourself tour from Porto to the Douro Valley using public transport, find out how you can experience the highlights for under €45 using my guide. Ideally you should stay at least one night in the Douro Valley to make the journey time worthwhile. If at all possible, stay on a quinta (wine estate) to fully appreciate the unique charms of the world’s oldest demarcated wine region. You’ll find my suggestions for the best places to stay in the Douro Valley in this article. If you have a car, take a look at these traditional Douro wine villages. There’s more to the region than wine and food, of course, so if you’re interested in nature, history and architecture, you could easily fill a week in these parts. Walking in the Douro is possible, although marked trails are thin on the ground and there are lots of hills. Some local tour operators offer experiences that include anything from a 2-hour vineyard walk to a full day’s hike that can be done from a base in the Douro. I’ve also had the pleasure of doing a week’s self-guided walking holiday in the Douro. Let me know if you need help organising a guided or self-guided walk in the Douro wine region. Next Post: Why Is Golf In Portugal So Popular? I was planning to be in Porto for 3 nights and 3.5 days, but now I am thinking that we may actually stay in Douro Valley for one night to get the full effect. We would like to stay in a nice hotel overlooking the river and vineyards. We would also love to do the river cruise! what would be the easiest place to stay? hi. Perhaps I’ve missed it but what is the name/website of the small luxury tour you took ? sounds like a great one. how do I find it ? This is a great website/blog and very useful for our planning. We will be in Fatima in July for a pilgrimage and then driving to Pinhao and on to Santiago. Two questions: will there be an issue with rental car company about driving in Spain? How “bad” are the mountain roads around Pinhao? My wife does not do well with winding roads. Thanks. Hi Jim, I believe that insurance can be an issue if you want to rent a car and drive in more than one country. You’ll need to check with the rental company about that. As for the roads around Pinhão, they are pretty winding. The N222 between Pinhão and Regua is relatively mild compared to the ones leading away from the river so if you use the motorway as much as possible and only need to drive that stretch, she should be okay but I wouldn’t bank on doing much exploring within the Douro wine region. Your site is super helpful. Do you know if there are any wine tours from Porto to Douro Valley that don’t involve Port wine? We are not huge fans and are thinking we may need to head to Douro Valley without a guided tour to get the most out of it. We were only going to do a day- possibly two. Any insight is appreciated! Hi Julie, if you arrange a private tour, they can take you to wineries that don’t specialise in port or are just as good at producing table wines. Let me know if you want me to connect you with a suitable tour operator. Your blog is wonderful. I am visiting on my own and I have a great deal more comfort after reading all your tips. My question is that as a solo traveller I am on a bit of a budget but of course am happy to pay for not to miss items. – If I take a train from my hotel to Duoro Valley – should I get off at several points on the journey for sightseeing or take it straight to last stop? – Once there I would like to meet up with one of these groups offering tours of wineries, olive oil and perhaps add on a lunch depending on cost. What are your recommendations for this? I am thinking of doing it this way to save on costs of a full tour where they pick you up from your hotel. I’d like to spend the full day there and then head back to my hotel by myself. My husband and I along with another couple are going to Porto at the end of September. We will be in Porto from the 21st-24th and wanted to take a day trip to the Douro Valley or possibly stay one night if it made sense before heading off to Lisbon. Not knowing much at all about the Douro Valley, the best way to get there or where the most optimal places to explore would be if we are only there for one day. I would love any suggestions you may have to make our experience there a wonderful one. Any suggestions on the best way to travel to Lisbon from the Douro Valley? I also have one question regarding our stay Porto. I was reading your blog regarding places to stay in Porto and did not see Hotel Infante De Sagres, is this because it was under construction or are you not a fan of this hotel? I think there must be something big happening in Porto during the time that we will be there in September as quite a few hotels that you had suggested and I loved are sold out. Do you prefer the Intercontinental Hotel over Hotel Infante De Sagres? The Yeatman is sold out during our stay and they had suggested there sister hotel. thank you in advance for your help with assisting in planning our trip. Glad to have seen your website as we are planning a trip to Portugal this year. Interested in doing a day trip from Porto to Santiago da Compostela. Can you recommend a great tour operator that offers this type of tour? Also, do we need a guide to explore Porto or can this be done independently? This is our first time to the country. Thank you and look forward to your suggestions. As for Santiago, this one day tour may be what you’re looking for. It was very interesting to read the blogs and suggestions on your website. My family is planning on travelling to Lisbon and would like to travel to Duoro Valley. Originally my husband was thinking of driving from Lisbon airport to the Duoro Valley, but I’m not sure if that will be stressful or not. Could you give us suggestions as to where we can hire a driver to drive us from Lisbon airport straight to Duoro Valley. We plan to go from Lisbon to Duoro the day we land, and stay in Duoro for about 1 day and off to Porto, then back to Lisbon. Thank you! Flight from Lisbon, Portugal to San Francisco. We have never been to Spain/Portugal and will be traveling by train, except thinking of taking a flight from Seville to Porto? What are your thoughts? Any suggesstion will be greatly appreciated. Agreed that it is so nice to find you on the internet. I too would appreciate some insight from you regarding sight seeing. We are taking a 10 day escorted tour in April starting in Porto and ending in Lisbon. We want to arrive earlier and leave later and would really like to add some must see spots as well as some of the Portugal that the tourist doesn’t see. Can you advise us on how many days to add before the tour and after the tour and what you would recommend we do? Are there any economical tours/guides for 2 people? Also what is the best way to get to and from the airports in Porto and Lisbon? – a sightseeing tour of Porto with a local guide. -visit to a Port Wine Cellar for a tasting. -Douro River Cruise with dinner. – tour Minho province to the former Roman ‘Bracara Augusta’. Here, drive to the top of the 1,300 foot high hill of Bom Jesus, from where you can overlook the city of Braga and admire the famous Holy Way staircase. Proceed to the town of Guimaraes for a walk through the medieval alleys. – visit Castelo de Vide and old Jewish Quarter. -guided tour of Evora. Discover the town’s massive walls and Roman Temple, early Gothic Cathedral, and Sao Francisco Church that is famous for its Ossuary chapel, visit Evora’s main square, the Praça do Giraldo,. Hi Adrienne, From the itinerary you sent, you’ll be spending very little time in either Porto or Lisbon so I would add at least one extra day in Porto and two more for Lisbon, even more if you want to do day trips south of the city. The most economical tours would be self or audio guided, such as the ones I have created – see my half day tours: https://juliedawnfox.com/best-portugal-tours/ Alternatively, small group tours such as this Porto food tour would probably be the best option. You can use the metro to get from Porto airport to the city centre, a shared shuttle arranged at the airport or a private transfer arranged in advance. Same options for Lisbon plus airport bus. Hello Julie, how nice to find you on the internet. Could I get some insight from you regarding sight seeing. We are flying to Portugal on Sept 8. We are in Porto from the 9-11. In Lisbon from Sept 12-14 and in the Algarve from 15 -28. We would really like to see Portugal that the tourist doesn’t see. What do you recommend? Are there any economical tour guides just for ourselves 2 people? Got your message, you are amazing! Actually, I have a few more questions – I let myself write you an email. Would you be so kind to take a look? – I was thinking of travelling there by train. What is the best place to get off? Pinhao? Regua? Any other? – Actually, I was thinking of spending just one day over there, but maybe it makes more sense to stay for 2 days? My husband and I will be in Porto Oct. 10-14, and would like to do a one-day trip up the Douro (train one way, or maybe both ways); preferably as far as Picinho. We would like to visit at least one wine estate (and have lunch somewhere). What do you recommend? We prefer independent travel. In what way do you want to use it? If you want to publish it anywhere, please email me with details so that we can discuss terms. If it’s as a reference for planning purposes, that’s fine.